As most Irish people are well aware, the Government through Minister Phil Hogan recently announced that, on 1 January 2012, it will be introducing at least two new charges on households: an annual property tax and an annual water charge. Flying in the face of all principles of taxation and economics, both are due to be flat charges, “at least for the moment”. “Flat charges”, or poll taxes, are one of those rare areas where economists, environmentalists and what one might term normal people all agree: they’re silly. On the one hand, they will do nothing to promote better use of either water or land – in fact, they may encourage people to waste water, precisely because they feel that they’ve paid for it. On the other hand, they are incredibly unfair, as someone who lives in a one-bedroom apartment has to pay the same as someone who owns a five-bedroom detached property with substantial land and a swimming pool. The justification for the water charge is at least somewhat believable: they can do no better until they install house-by-house water meters and that costs money… hence the charge. You could view it as the charge you have to pay for a couple of years to enable the government to get off your case and on to the case of people wasting water. However, the line trotted out for the property charge is distinctly unbelievable. As thejournal.ie reported: “because a property tax would be dependent on seeking a valuation of every property in the country, a flat rate will need to be introduced in the meantime”. This is apparently the limit of thinking in government circles: if we can’t do it 100% right, we should do it 100% wrong in the meantime. I don’t want to be overly sensational, but is the Government not aware of what happened in the UK when the Government there tried to introduce a poll tax, let alone what’s happening in Greece and elsewhere at the moment? A quick search on YouTube throws up some pretty scary scenes: here’s one from central London in 1990. As readers of this blog are aware, though, I’m not a fan of giving out for the sake of it – I try and make some sort of constructive suggestion. I’m hoping today’s suggestion will be particularly useful. It’s a simple one. Put every Census district of the country into ten different bands of the approximate cost of land and scale the property tax according to that. There is a wealth of information out there on Ireland’s property market, which the Government can use to find out the approximate “pecking order” of property values around the country. This would then be a very handy interim step towards the introduction of a full and fair land value tax, as discussed last week. I can go one better than make the suggestion, I can actually do it! The map below puts each of the 3,400 Census districts in Ireland into one of ten land-value bands, from the top 10% around south Dublin and north Wicklow to the country’s cheapest homes in the Upper Shannon region. It’s based on research I’ve been doing in Oxford (a preliminary version of which I presented at the annual Spatial Economic Research Centre conference in London last month). The mapping is entirely thanks to Justin Gleeson of the National Institute for Regional & Spatial Analysis at NUI Maynooth, although the blame for its application for this purpose rests entirely with me. An underlying spreadsheet of the price per Census district is available for the Government, if it is interested. For those who are curious, the map is calculated using the 200,000 advertisements of properties for sale on daft.ie from the start of 2009 to the end of 2010. The underlying analysis gives a like-for-like price per Census district, controlling for a range of property attributes, such as type, bedroom number and bathroom number, and – quite importantly – for the date the property was advertised. In that way, what you’re seeing is stripped of the time aspect, it’s even stripped of the level (so the fact that it is just asking prices doesn’t really matter) – it is just a ranking. Not enough free economic consultancy? OK, I’ll go one further and even suggest some bands! Roughly speaking, there are about 1.5 million private households in the country. Suppose that the Government wants the interim charge to bring in €1,500m when it’s fully running, as a precursor to a proper land value tax that contributes about €2,000m per annum to the Exchequer (this is on a par with what other countries get from property tax). That suggests an average charge per household of €1,000. Clearly then, a suitable charge for the top band of properties would be in the region of €1,400 a year, while one for the lowest band would be about €500. I would also suggest, while I have the stage, that to make it easier, PAYE workers should be able to deduct it from source, so it comes out as extra €40-€120 a month in tax. Clearly, people who live in small properties in expensive locations will be less enamoured with this proposal than those who live in large properties in cheap locations. Certainly, a full property tax would not only take location into account but also size of the plot of land. It’s important to remember, though, that ultimately the most efficient property tax is one on land, not on the buildings and improvements on top of the land. Put another way, those who live where land is more valuable benefit from better amenities, like access to labour and consumer markets, and better public services. This tax should be used to help sustain those amenities and improve them elsewhere… and when other areas benefit, they pay up too. I’m not arguing that this is a perfect rendering of the contours of land value in Ireland. Indeed, you could do one sanity check very easily, by cross-referencing the house prices map with one based on rental data for robustness (don’t worry, lads, I have that done for you as well!). And if I had access to Property Registration Authority data on transaction prices and the Registry Office information on what properties are where, we could really make sure we got this right. But that is actually work that takes time and mightn’t get done by January 1st next. What we can do, though, and what I’ve suggested above, is hopefully simple: instead of getting it 100% wrong before getting it 100% right, why don’t we get it about 50% right first? Surely that makes sense. You are discussing a fair way to alklocate a tax between 500 and 1400 per annum per household. The govt plan is to introduce a tiny flat tax in the first year such as 100/annum which would be less than everyone would pay under a weighted system. The logic of a very low tax in the 1st year is that it is very difficult to introduce a new tax but not so hard to raise tax rates in later years. Perhaps they should follow something like your example in the first year so that people pay between 50 and 140 euro. Taxes are more acceptable to people when they believe that they are equitable. One thing I don’t like about your map is that a tax based on house value would appear to be a tax on living in cities. Living in the country and then driving a long distance to a city to work every day imposes costs on society through increased cost of service provision to dispersed remote locations. Why should the state punish people who choose to live in more modest urban dwelling with lower household costs externalised on society. I think if you had access to the Non Principal Private Residence data you would be able to account for high house values outside the urban areas in places like Connemara, the Galway Bay coastline, the Burren, the Dingle peninsula and the Co Cork coastline. I don’t think the natives would be too happy with your analysis if you did not allow for the house price distortions that Holiday Homes in scenic areas contribute to. Perhaps an increase in the NPPR might help level the playing field? Interesting analysis. Just on the intro I wouldn’t say that a poll tax “flys in the face of all principles of taxation and economics”. A poll tax (in the literal sense) is the most efficient form of taxation; it is also the most inequitable. That is a trade-off that will always be faced. One health warning on the daft.ie valuations is that they are based on what the seller thinks they can get for the property, and some prominent estate agents are still living in the 2007’s. There is a wide margin between the sold ‘at’ price and the sold ‘for’ price. The government, banks, mortgage providers and revenue commissioner has had the real data for years but for some (questionable) reason is reluctant to share with citizens of the country. I think everyone is aware that the boom was fabricated, so having the data won’t surprise anyone, but unfortunately they are now trying to obscure the reality of the crash, which is and will be much worse that anyone is willing to admit. Let me get this straight – you get free water in Ireland? Bravo! An excellent contribution to public policy. Please post any official response that you receive. If you’re using Stata, it _might_ be possible to convert CSO’s census shapefile (http://beyond2020.cso.ie/censusasp/saps/boundaries/census2006_boundaries.htm) to generate maps directly from Stata using shp2dta and spmap. Ireland doesn’t have interconnected water services nationwide. We have 440,000 sceptic tanks. Many have no connection to anything else. There is a good chance a demand for payment for water services would have to be waived for anybody who hasn’t got water services, or pays a group scheme or private operator for water. Either that or you nationalise water. I believe Michael Shiels book on rural electrification has a few pages on water services. Part of the reason Ireland hasn’t charged for water services is because all too often they are non existent. Phil – there is no such thing as “free.” Local taxes paid by business rates to local authorities pay for water, well where it exists. Group schemes exist in some rural areas but some people just use sceptic tanks. Lots of areas are too far away from the mains for proper sewage services to be connected. Outstanding article, and the spatial analysis ain’t half bad either. On the point as to whether a property tax is a tax on living in a city, well, kinda, in that us urban dwellers have the benefits of external economies of scale across a swath of costed and non costed services; a property tax merely means that we pay for the services provided to us. On the flipside, it is only right that rural communities pay for the services that they get ‘for free’, in that they are largely funded through social transfers from the State (income or consumption taxes collected from urban dwellers) or through charges buried in universal service provisions. The extremely poor spatial planning of the last 20 years, compounded by lax controls on one off rural housing means that we’re locked even further into population distribution that is far from the optimal to provide services to (everything from water to electricity to broadband – and on paying environmental fines from lax water quality from all of thise septic tanks). Working that one out is a lot more difficult than just slapping on a property tax though, because it cuts across a whole range of sectors, and because the rural political lobby is still clinging on to political influence. On the practical issue – obviously, the Govt couldn’t use the ‘asking price’ data from one commercial service provider (there are a succession of biases that could arise), but they certainly have the datasets to do it independently. 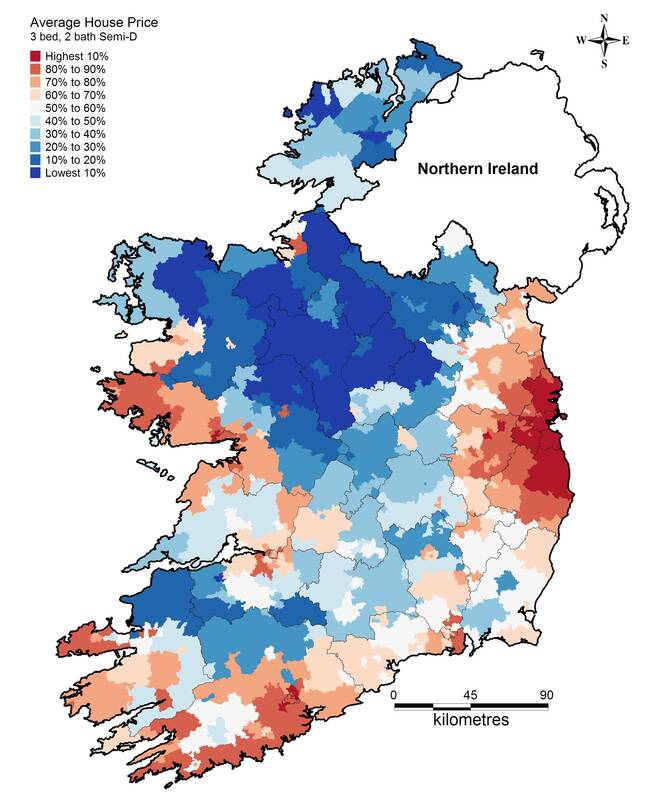 What would be interesting to see would be a map of the differential rates at which prices rose and fell nationally; the spatial pattern in the map above correlates surprising closely to the commonly perceived sterotype (that the boom was at it’s most frothy in the Midlands), and that prices in certain areas have remained stubbornly high (West Cork, Connemara etc). Then we could dig out the Regional GVA data, and cross correlate. Lovely. 1) A small flat in an expensive area will attract higher tax than a 40 bed mansion in a remote area. This could lead to a sort of ethnic cleansing (if the rates are high enough) whereby less well of retired people are forced out of cities. 2) Tax influences behaviour – the most important thing to remember. Why do we want to ‘punish’ people living in expensive areas? 1) Charge simply by the square footage of the property. Large house pay loads, small flats pay peanuts. End of. 2) Drop the idea of property tax entirely. Remember that tax influences behaviour. Raise the price of something and consumers will consume less of it. So why attack property now that its in the doldrums anyway? A much better idea would be to simply tax energy derived from fossil fuels. People in large mansions with flood lit golf courses and swimming pools pay loads, grannies in flats that turn the lights off pay hardly anything. Sorry forgot to add – another idea. Why not do away with stamp duty (a ludicrous tax on moving) and simply turn it into an annual charge? So for example, you would pay 0.5% of the value of a property EVERY year. A poll tax of €1,250 on a house / flat worth €250k. Sounds reasonable. The problem with the british system is that a house worth €20m (and there are more of those than you might think in London) attracts a top band rate of something like £3000 whereas the bottom band council flat worth £65k is something like £900. A tax rate of 1.4% for the pauper vs a tax rate of 0.00015% for the millionaire! Its an easy tax to cacultate. You simply tax the price that the house was last transacted and bring it up do date using an index of regional price developemnts. So if a house was last sold in 2001, that price is known and can be updated to its current ‘value’ and taxed accordingly. Every time a house is resold, it gets more accurate. If its going to be a flat tax, at least let it be a flat % of the best value we can esimate, not the bogus regressive nonsense that we have in the uk. Personally I would love to see owners of houses costing €20m paying their fair share – an annual charge of €100,000!! Failure to pay within 30 days – seize the property and auction it! All very well imposing an annual property tax on a residence. However the quality of many residences are very very poor. For example in many houses one can barely walk around the end of the bed, due to the fact that the bedroom is so small. Many apartments are already paying 100E a month in management charges, some even more. However the vast majority of apartments just have no storage space. The suitcase has to go into the wardrobe, or in the bathtub. Again another example of low standards in planning. A lot of housing estates have been built which incorporate high density. A house normally will not have a side entrance, no garage, very small gardens and one can see into the neighbours bedroom. I feel there is a loss of opportunity for parents to teach their children certain skill sets, for example a teenage child could learn about making a canoe out of fiberglass in the garage, or model aircraft from balsawood etc. These are just a few examples of skills passed down from parent to child. If we continue to encourage the building of small residential high density units then I believe there will be reduced opportunities for children to learn certain skills from their parents. Other concerns would be water charges, some areas have very good water with low hardness. Certain areas in the country have extremely high levels of hardness. Limescale ends up destroying kettles, washing machines, boilers etc etc. Will there be room to reduce the cost of the water charge to people who recieve water with very high levels of hardness? Its a bit insulting to have to pay for water which ends up destroying certain domestic equipment. The main point I am trying to make is that I don’t mind paying for something if in return I have a decent standard of water or accomodation to enjoy. Briefly, a flatrate property charge is not a ‘poll tax’. The UK charge was a per individual charge, and paid for by those individuals, which required knowing where every individual lived and making them as individuals pay, including many who were entirely otherwise outside the tax net and who had relatively few incentives to remain in good standing with the tax authorities (such as transients and students, and others with little income or assets). A flat rate property charge would be paid only by property owners, would not require any knowledge about who was living where, and property owners are a) much fewer in number and b) have much greater incentives to stay on the right side of tax authorities, than those the UK poll tax attempted to levy. Excellent article but where would the govt think people can get the money to pay a property tax. This would envitably drive alot of people out of the country. So where am I supposed to get this 1,400 a year to pay for nothing in return for a house thats supposed to be mine. Where do ppl get 500-1400 a year to pay this. It’s ludacris! We shouldn’t even be looking at this as a possible form of Tax with the state of the house market as it is. Put forward by either people with the means to pay or people with no property.